Summary: Outdoor gardens play a crucial role in exterior design. Looking to spruce up that dull garden of yours without spending hundreds (even thousands) of dollars? Here are some ideas that’ll make your backyard stand out. 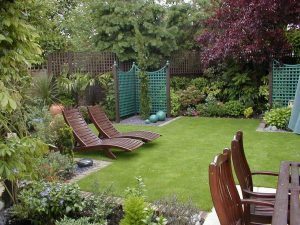 One of the easiest ways to improve the overall aesthetic of your garden is to cut the lawn into a defined shape – like a square or a circle for instance. All you need to do is mark the specific shape that you want it grow into and use a spade to cut away the excess grass. It’s simple job to do and won’t take up much of your day. Additionally, it can pave the way for new gardening ideas in case you want to add on to it. A cost-effective approach to filling in flowerbeds is to purchase perennials that you can divide up. It sounds advanced at first, but it’s quite easy. Tip the plan out of the pot and pull it apart into two or three pieces – each with its’ own stalks and root. You’ll want to dig out a hole and plant each part separately in your flowerbed. The following year when they’ve become fully grown, dig them up and pull them apart again for an even larger plant base. After a couple of years, you’ll get a wondering looking display. One way that you can improve the overall appearance of your garden is to place a variety of furniture pieces and accessories that complement the color and look of your flowerbed. For instance, say you have a set of tulips all lined up along the walkway, you could lead it to a seating area that’s furnished with a comfy outdoor bench and a table – perfect for coffee in the early mornings. By decorating around your garden, you’ll utilize the appearance of the flowers to enhance overall look of your backyard. Blog submitted by The Foam Factory: Whether you require seat backs for your outdoor sofas or memory foam for your bed, The Foam Factory carries it all. Visit them online today!